A sledge from the first expedition to the Antarctic led by Athy-born explorer Ernest Shackleton is the top lot in Bonhams Travel and Exploration Sale in London on Wednesday, 6th February next. It is estimated at Â£60,000-100,000. The sledge was used on the 1907-9 British Antarctic (Nimrod) Expedition by Eric Marshall – one of the four men, with Shackleton, Jameson Adams, and Frank Wild, to undertake the sledge march to the South Pole. Although they had to abandon the attempt, they reached within 100 geographical miles of the Pole – at the time, the furthest south ever travelled. In preparation for the trip, Shackleton commissioned sledges in various sizes. The example in the sale is one of eighteen eleven-foot sledges – a size favoured for its manoeuvrability – that he purchased for the expedition. The four men of the Southern Party were accompanied on their journey by four ponies, each pulling an eleven-foot sledge. During the march, the ponies gradually succumbed to the conditions; three had to be humanely killed, and the last fell into a deep crevasse nearly taking the supplies and Frank Wild with it. Two of the four sledges were left where the first two ponies had been put down, as depots for the return journey. The two remaining sledges went further south. Bonhams Head of Books and Manuscripts Matthew Haley said: "Shackleton was one of the great figures of the heroic age of Polar exploration, and the Nimrod expedition was an important chapter in the story of the race to the South Pole. Few of the sledges used during the Nimrod expedition survive; of those that do, this appears to be the only one with a direct link to one of the four Southern Party explorers, and I think it will be of great interest to collectors." The sale also offers Eric Marshall's sledge flag, estimated at Â£30,000-50,000. During the expedition, each of the four men of the Southern Party had his own personal flag, and these – including the one belonging to Marshall – are clearly visible in the many photographs reproduced in Shackleton's best-selling account of the expedition, Heart of the Antarctic (1909). 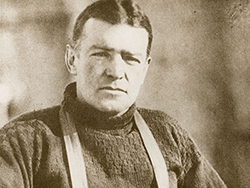 Writing about Shackleton in the current edition of Bonhams Magazine, the writer and campaigner Rosie Boycott recalled his status as a great British hero, "He became famous for making a journey so dangerous that even today, with modern high-tech kit, no one would repeat it. And, because his men loved him and trusted him to a fault, he was able to step from the mountains of South Georgia, not just into legend, but into the ranks of superhero whose name would forever be associated with the highest qualities of leadership, ones that seminars have laboured to teach students ever since." The Athy Heritage Centre Museum is home to the world's only permanent exhibition celebrating the explorer and hosts the annual Shackleton Autumn School. A major redevelopment of the museum is being planned at the former Town Hall building, which is located in Emily Square.